Suicide and non-lethal suicidal behaviors represent a global public health problem with estimates of around one-million suicides yearly and likely 20 to 25 million suicide attempts per year. Although controversial, if United States-based estimates of the number of people intimately and negatively impacted by suicide are extrapolated to the rest of the world, an additional six million people world-wide become suicide survivors on an annual basis. One suicide is a tragedy – one million suicides is a catastrophe that cannot be ignored! To the extent that I can generalize from my experience as a suicidologist for over 20 years, and the concerted efforts of the World Health Organization, the International Association for Suicide Prevention, and the International Academy for Suicide Research notwithstanding, for most of us in the field, our efforts at understanding and preventing suicide and other suicide-related behaviors tend to be focused within national, regional, or local parameters. That is, although we may be rightfully channeling our research and prevention efforts to our particular cultural settings, doing so in the absence of a global perspective on suicidal behaviors represents a form of “tunnel vision” that many would agree parallels the psychological condition that brings most people to the brink of suicide. Thus, it is time to seriously move beyond our tendency towards “cultural encapsulation” to learn how suicide research, prevention and intervention perspectives outside of our national borders can provide a broader context to inform our local initiatives. To that end, I am very pleased to be writing this foreword to Suicide: A Global Perspective edited by Dr. Maurizio Pompili. In this volume, Dr. Pompili has brought together a host of international experts in suicidology to provide a global context for understanding suicide and suicidal behavior. Chapters in this text will serve to increase our understanding of both the unique aspects of suicidal behavior between continents as well as highlight some of the important risk factors for suicide that are more common across continental, national, and cultural boarders. The chapters in this volume have provided an impetus for me to think outside my national and cultural milieu in my work as a suicidologist. I trust it will do the same for you as well. This book is the result of contribution from scholars belonging to different fields that are all dedicated researchers in suicidology. More and more often we are faced with the fact that suicide is not properly prevented despite the enormous knowledge worldwide. Suicide is the leading cause of death for people worldwide, and one of the three leading causes of death for young people under 25. Every year, approximately one million people die by suicide - one death every two minutes. The World Health Organization estimates that by the year 2020, this annual toll of suicide deaths will have risen to one and a half million, and suicide will represent 2.4% of the global burden of disease. Suicide deaths account for more than half of all violent deaths in the world - more than all deaths from wars and homicides combined. Every year, many million more people make serious suicide attempts which, while they do not result in death, require medical treatment and mental health care, and reflect severe personal unhappiness or illness. Million more people - the family members and close friends of those who die by suicide — are bereaved and affected by suicide each year, with the impact of this loss often lasting for a lifetime. Suicide exacts huge psychological and social costs, and the economic costs of suicide to society (lost productivity, health and social care costs) are estimated at many billions of dollars each year. Because almost a quarter of suicides are of teenagers and young adults aged less than 25 years (250,000 suicides each year), suicide is a leading cause of premature death, accounting for more than 20 million years of healthy life lost. There are substantial variations in suicide rates among different countries, and, to some extent, these differences reflect cultural differences to suicide. Cultural views and attitudes towards suicide influence both whether people will make suicide attempts and whether suicides will be reported accurately. Suicide rates, as reported to the World Health Organisation, are highest in Eastern European countries including Lithuania, Estonia, Belarus and the Russian Federation. These countries have suicide rates of the order of 45 to 75 per 100000. Scholars worldwide have puzzled over what makes a person suicidal and what individuals who die by suicide have in their minds. Most often the focus is not on the motives for suicide, nor on the phenomenology of this rare act. It is rather on what is found from small cohorts of suicidal individuals. Each day, dozens of papers on suicide are added to the enormous literature related to this topic. Models of suicide are less frequently encountered in the literature. It is difficult to produce a sound synthesis of a complex phenomenon, after which many in the scientific community comment that the model omits key features that are not easily identifiable. The lack of models that can actually help in the management of suicide is reflected by the fact that suicide rates have been only mildly changed by the tremendous efforts in this field. Various models have been reported for suicide such as (1) the scientific view - suicide is caused by factors beyond the individual’s control (the determinist view of suicide), (2) the “Cry for Help” - individuals who die by suicide do not want to die but are seeking help to reduce their distress, (3) suicide as sociogenic - social forces causes suicide (Durkheim’s altruistic, egoistic, anomic and fatalistic suicide). More recently, a stress-diathesis model has been proposed in which the risk for suicidal acts is determined not merely by a psychiatric illness (the stressor) but also by a diathesis. This diathesis may be reflected in a tendency to experience more suicidal ideation and to be more impulsive and, therefore, to be more likely to act on suicidal feelings. Many clinicians perform careful assessments for suicidal risk in their patients and assume that suitable treatments will resolve this risk. They rarely investigate suicidality in-depth in their patients. The key words here are from the Ancient Greek aphorism "Know yourself" that were inscribed in the pronaos (forecourt) of the Temple of Apollo at Delphi. There are myths and resistances that impair a proper understanding of suicidal people. Many believe that talking about suicide will reinforce the patient’s suicidal ideation, others believe that, when patients talk about suicide, the risk of suicidal behaviour is low. (“Those who talk about it don’t do it.”). Myths and stigmatization should be replaced by a meaningful phenomenology of suicide that involves a true understanding of the suicidal individual’s intimate world. Increasing globalization, ease of international travel, and refugees and asylum seekers from war and disaster have swelled the number of immigrants worldwide. People who are alienated from their country and culture of origin are vulnerable to various stresses, mental health problems, loneliness and suicidal behaviour. Suicide prevention strategies, tailored to the specific needs of migrant groups, exist in many countries. These programs typically focus on understanding the specific cultural and religious attitudes to mental health and suicide of the migrant group, reasons for migration, and family and social structures. Interventions include educational and social programs designed to identify stresses, teach coping skills, promote use of preventative health practices, improve access to health services and encourage socialising. Suicide prevention programs for migrants may require involvement, championship or leadership from religious or community leaders to be successful. During the last three decades we have learned a great deal about the causes of this complex behaviour. Suicide has biological, cultural, social and psychological risk factors. People from socially and economically disadvantaged backgrounds are at an increased risk of suicidal behaviour. Childhood adversity and trauma, and various life stresses as an adult influence risks of suicidal behaviour. Serious mental illnesses, most commonly depression, substance abuse, anxiety disorders and schizophrenia, are associated with an increased risk of suicide. Diminished social interaction increases suicide risk, particularly among adults and older adults. Despite its often complex origins, suicide can be prevented. Communities and societies that are well integrated and cohesive have fewer suicides. Restricting access to methods of suicide (such as firearms or pesticides) reduces suicides. Careful media reporting of suicide prevents further suicides. Educating communities and health and social services professionals to better identify people at risk of suicide, encourages them to seek help, and providing them with adequate, sustained and professional care can reduce suicide amongst people with mental illness. Providing adequate support for people who are bereaved by suicide can reduce their risk of suicide. Such an appraisal of phenomenology of suicide stresses the need to better understand the suicidal dimension as opposed to the psychiatric dimension and to avoid myths and stigmatization. This book is an attempt to put together some of the knowledge on suicide and propose proper suicide prevention actions around the world. 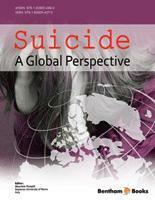 It presents the rare opportunity to get to know the phenomenon with a broad view of suicide in various continents. Controversial topics are also related to the suicide risk, which makes this volume an update resource for those who want a global perspective.